We’d love your help. Let us know what’s wrong with this preview of Hell Of A Deal by Mark Huntley-James. Paul Moore, shopkeeper, Master of the Dark Arts and demonic broker, has just met the hottest witch who ever tried to kill him. A date is surely out of the question - she serves the demons of the Babylonian Triad, and no-one defies them... almost no one. Paul thought he was the best, until the Babylonian Triad launched a turf war. Rival demons, competing traders, an explosive spice and ruthless church factions... Paul only wants to keep his home town safe and get the girl. He knows that being a Master of the Dark Arts involves sacrifice, but really doesn't want to be the one dragged to the altar. 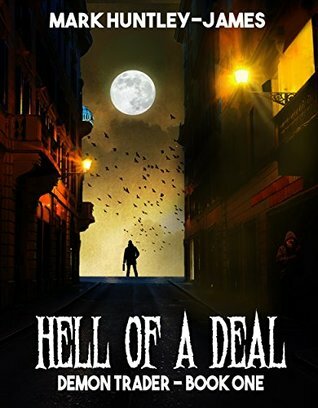 Hell Of A Deal is a fight through life, death, demons and trying to survive a first date. It's not the end of the world, just the start of a new corner of hell. To ask other readers questions about Hell Of A Deal, please sign up. I was given a copy of this book for an honest review. Quite frankly, it's not my usual reading fare. I got confused with Stacey and Tracey because the names were similar. The characters are wacky and the town is filled with demons. There are enough plot twists to keep you turning the pages and entertained. I unexpectedly enjoyed this book and recommend it to anyone who liked shows such as Buffy the Vampire Slayer and Angel grown up. Disclaimer: I received a free copy of this book for review. I wasn't given any other inducements, but fortunately, the book is an inducement all on its own. Huntley-James writes with verve: from the first page, the reader is swept along by the energy of the writing; it flows and it bubbles - a bit like white-water rafting, but less damp. The main character, Paul Moore, is a broker of demon contracts; this is definitely Dark Arts, and Paul is pretty much an anti-hero. Along with Paul, there is a h Disclaimer: I received a free copy of this book for review. I wasn't given any other inducements, but fortunately, the book is an inducement all on its own. The main character, Paul Moore, is a broker of demon contracts; this is definitely Dark Arts, and Paul is pretty much an anti-hero. Along with Paul, there is a host of other 'interesting' characters - the other demon-summoners in the town (how many practitioners of the Dark Arts can one small English town hold? A lot, apparently); Paul's employees, Stacey (skinny [or not] and goth [or not]) and Billy (a man with hidden depths). Many of the characters are a bit wacky, but they all have that spark of life - they feel alive, not just constructs the author put together because he needed a character to do a certain thing. And like living people, they often do unexpected things, or turn out not to be quite who you thought they were. Then, of course, there is the lovely Simone, witch, who has her own plans, which may or may not include Paul, living or dead. The action starts immediately, and it doesn't let up. At all. Several times, I caught myself thinking "in any other book, this would be the final action sequence"; not so here. Things explode (sometimes), catch fire (frequently), run out of control (occasionally) or get stolen (nearly all the time). People die (or not) in a variety of interesting ways; Huntley-James is not afraid to kill off his characters. I burned through this in two sittings, but that was only because I have to sleep at some point. It was fun. If I were to do the 'what other books is this book like', I'd say, Sandman Slim or Dead Things rather than Storm Front. However, it's lighter (despite all the death and destruction) than either of those - distinctly reminiscent of the The Stainless Steel Rat (and Simone reminds me a lot of Angelina, the beautiful super-criminal who steals Slippery Jim diGriz' heart... and other things). First off, this review is by the author's other half. This means I've read Hell of a Deal (formerly Demonyka) a LOT of times. :) What I would like to say to potential readers is, even though I have read this book in several drafts, when I read the final version last November, just before it was released, there were still bits that made me laugh or wince for the characters. Mark has a lot of energy in his writing – actually a lot of energy in everything – and that comes through in this book. Hell First off, this review is by the author's other half. This means I've read Hell of a Deal (formerly Demonyka) a LOT of times. :) What I would like to say to potential readers is, even though I have read this book in several drafts, when I read the final version last November, just before it was released, there were still bits that made me laugh or wince for the characters. Mark has a lot of energy in his writing – actually a lot of energy in everything – and that comes through in this book. Hell of a Deal is set in an ordinary town somewhere in the south of England – well at first sight it is an ordinary town – but how many towns have multiple demonic brokers working there? Paul runs a magic shop and does a lucrative business as a demonic broker, arranging safe deals with Demons. Or at least safer than you'd manage if you went with a DIY deal. Then Paul's comfortable life gets really shaken up. I love the twists and turns of the plot, the vividness of the minor characters and the realistic feel of the setting. He trained as a physicist and worked in R&D for a number of years before moving to commercial software development and now lives on a smallholding on the edge of Bodmin Moor with his partner, multiple cats, chickens, geese and a flock of rare-breed sheep. In between all of that he learned to clog dance, spent weekends as a pikeman in 17th century battle re-enactments and kept bees for several years. In 2013 he won first place in the British Fantasy Society Short Story Competition.